A black and white photograph of an Administration Building at 900 Gordon Street. The Administration Building was built in 1925 and several additions were made to it in 1958. 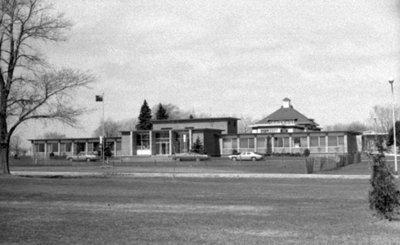 The building was demolished in 1994 to make room for the new hospital which was built from 1993 to 1996 and is now called Ontario Shores Centre for Mental Health Sciences. 900 Gordon Street, April 1976, Brian Winter. Whitby Archives A2013_004_017C.